2017/18 Marks our 10th year in business! Thank you for all the amazing support of us over this time. We are extremely excited with our growth over the years and love being blessed enough to look further, dream bigger and reach further than we ever have before. So, with all this exciting growth and change we want to celebrate with you all! We got here because people believed in us and trusted us to build them their dreams. Whether it was a renovation, shop, addition or custom home, you, our clients, industry partners and friends are what got us here! Please join us on June 22nd between 3 – 9pm. There is going to be food cooked over a fire, cupcakes, slushies, balloons, and lots of fun to be had. Also, you will be able to walk through 2 of our Tiny Homes! We are thankful to be able to be working alongside Food for the Hungry and the Abbotsford Foundry and they will be on site as well! 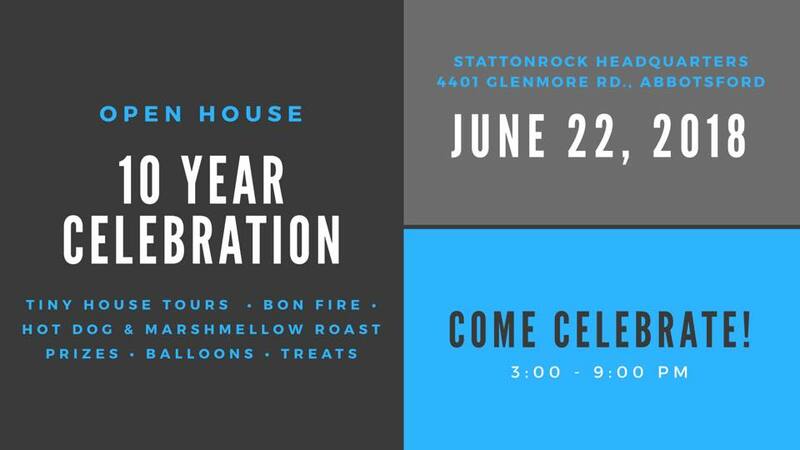 Come on out, bring the family, eat some food, tour our offices and Tiny Houses and let’s celebrate!